A prolegomenon for medical anthropology. Decades of medical anthropological work have helped disrupt notions of biomedicine’s soteriological basis, its unquestioning moral rightness, and its fundamental commitment of doing no harm. Through the concept of structural violence, anthropologists have shown how, despite the best intentions of medical providers, medicine can unintentionally perpetuate harm, particularly toward communities who need medicine most. Examples abound of medicine’s ability to facilitate and inflict debility or illness: scholarship on chronic pain, cancer treatment, and rising death rates in hospitals from methicillin-resistant Staphylococcus aureus,have become matters of serious concern across the globe. Meanwhile, medical anthropologists working in acutely unstable, war-torn settings have shed light on how bioethics and humanitarian notions of medical neutrality—particularly the neutrality of medical providers—are inadequate for capturing how public health hospitals and clinics have been deliberately targeted, from Iraq to Gaza to Syria. Medicine has also been used as a tactic of war, such as how public health campaigns were used by the CIA as a cover to catch and kill Osama bin Laden in Pakistan, a strategy which yielded devastating consequences, including attacks on healthcare workers and spikes in infectious disease rates, due to fears about nefarious geopolitical interference. Accounts of wide-ranging forms of biomedical harm in radically different social, political, and economic contexts call for a rediscovery and re-invigoration of a classic theme in medical sociology and anthropology—clinical iatrogenesis. Popularized by the Austrian public intellectual, Ivan Illich, the concept of clinical iatrogenesis, defined as injuries done to patients due to ineffective, erroneous, and unsafe treatments, demands that rather than only see harm as an unintentional or accidental effect or byproduct of medicine, we need to interrogate how it emerges from deliberative, direct, and systemic medical acts, processes, and encounters. In our hospital ethnography in the Indian and Pakistan-controlled Kashmir region, we found healthcare providers were not unaware of the deep harms rising up out of medicine, but neither were they always prepared to recognize iatrogenesis solely in political, structural, or infrastructural terms. Our concerns are not only for spectacular forms of injury, but, rather, also for the ways injury can be built into everyday bureaucratic mechanisms and structures of care, and made routine and familiar. Iatrogenesis can index how biomedical harms can be an expression of both under-resourced and over-medicalized healthcare settings. Iatrogenic harms are made even more peculiar and ironic by the fact that they emerge from practices defined exclusively by their ameliorative and life-sustaining properties. In our cross-border research on public health systems in Indian- and Pakistan-controlled Kashmir, respectively—two of the most militarized places on earth—we try to trouble and even undo the assumed good or neutrality of medicine by evaluating its darker, shadow side. As medical anthropologists, we are interested in how long-term conflict leaves traces in public health infrastructures, and how medicine’s soteriological foundations are manipulated, twisted, or mangled in everyday clinical practices, such that the lines between practice and malpractice can become exceptionally blurred. Our work asks, Which political impulses are at work in under-funding or withholding care (that is, in creating the conditions of possibility for iatrogenesis)? How can specific, individual acts of mistreatment be publicized to fuel and reify collective anxieties about medicine as a vector of harm? What of medicine as an instrument of political wrongdoing or aggression? These questions have urgent consequences for both our field-sites and many other sites of care across the world. In Indian-controlled Kashmir, decades of counterinsurgency operations, including sieges (colloquially called “crackdowns”) designed to flush out militants or terrorists who might be hiding within civilian populations, have left their mark on public spaces, including public health infrastructures. During sieges, village clinics are often turned into temporary torture chambers. As described in one account of a crackdown in the village of Seer, Kashmiris reported hearing screams emanating from the clinic, and after successive uses of the clinic as a torture chamber, people no longer referred to the clinic as the “village clinic,” but rather as the “crackdown clinic.” Similarly, the cricket ground is now the “crackdown ground.” This example shows how militarism profoundly reshapes the topography of everyday life, including the way people relate to and experience public health infrastructures. How does one seek care in a space in which the cries of torture are still memorable? What traces are left by the repeated appropriation of medical spaces for counterinsurgency purposes? Traumatic, collective events, such as sieges, crystallize existing fears about medicine and public health systems and their propensity to inflict harm, which are always already present in the everyday. People speak about these fears in both direct and indirect ways—through the telling of alternate histories and naming (“the crackdown clinic”), but also through practices of visuality that foreground hauntings and the presences of ghosts and other spectral beings, such as jinni. 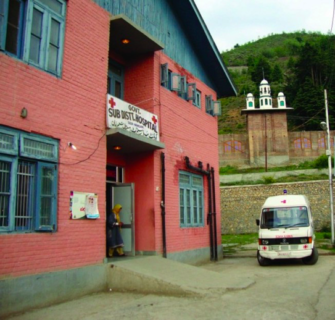 Accounts of the appropriation of medicine to political and military ends shows the need to more carefully attend to the long-term, perceptible and imperceptible effects of violence on spaces of care; how these traces do not simply disappear, but must be thought of as palimpsestic—as overwriting the possibilities of neutral, objective, and apolitical care in Kashmir in favor of something more purposeful, anxiety-producing, harmful, and dangerous. In Pakistan-controlled Gilgit-Baltistan, the combined effects of decades of state neglect and Shia-Sunni enmity or “tensions,” as they are locally called, have significantly impacted how public health services are organized and provided and how medicine and its effects are interpreted. Between 2005 and 2012, several episodes of high-intensity, inter-sectarian conflict in Gilgit Town, the region’s capital, occurred in community and government hospital settings, where providers and patients were hunted across medical complexes, wounded, and sometimes even killed. In ways that heightened patients’ already shaky-faith in the quality of state health services, marked as they were by significant resource deficits and high rates of iatrogenic illness, injury, and loss, a number of deaths were attributed to medical personnel and rumored to have been made possible by medical means, such as “poison injections.” These stories were shared widely and gained social and political momentum in their retelling. Medical neglect, error, and malpractice were increasingly interpreted through a sectarian lens, and medicine understood as deliberately destructive rather than caring and restorative. More broadly, many saw hospitals and their services as the mediums through which sectarian and political machinations were realized and population-level harms enacted. Clinical iatrogenesis, defined as injuries done to patients due to ineffective, erroneous, and unsafe treatments, demands that rather than only see harm as an unintentional or accidental effect or byproduct of medicine, we need to interrogate how it emerges from deliberative, direct, and systemic medical acts, processes, and encounters. In turn, the persistence of inter-sectarian animosity, intimidation, and aggressions on hospital premises has yielded sometimes-seismic ruptures of collegiality among providers, and destroyed trust between providers and patients. 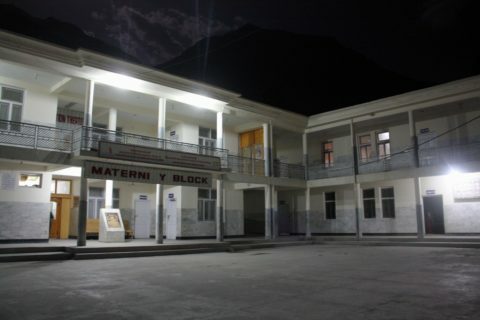 Starting in 2005, out of concern for themselves and their patients’ security, many Sunni personnel left their posts at the District Headquarter Hospital (DHQ), based in a predominantly Shia neighbourhood, and worked with local politicians to establish separate Sunni civil hospitals in Gilgit Town and neighboring communities. Gilgit’s sectarian medical economies and infrastructures speak volumes of the corrosive impacts of communal violence for healthcare systems. They also confirm the ways that deep, identity-linked enmities and exclusions become institutionalized, braided into healthcare and treatment encounters, and read in medicine’s worst outcomes. Rather than only see iatrogenesis as the result of individual misdeeds, then, our work also considers it as evidence of broad-scale and unmitigated injuries, which carry immense political consequences for the ways health systems are perceived and services taken up. In our hospital ethnography in the Indian- and Pakistan-controlled Kashmir region, we found healthcare providers were not unaware of the deep harms rising up out of medicine, but neither were they always prepared to recognize iatrogenesis solely in political, structural, or infrastructural terms. Yet, following from our findings, it is our contention that clinical iatrogenesis can tell an indelibly political story. Over time, repeated and routinized forms of harm or iatrogenesis mark and archive particular kinds of injustice and may help explain why, in certain circumstances, populations avoid, resist, or refuse available services. We ask medical anthropologists to more closely attend to medicine’s compromises, and consider hospitals as palimpsetic structures, internally animated by histories that are simultaneously medical, social, and political, and in some instances, haunted by prior acts of medical wrongdoing which can be remembered in traumatic and political terms. Through ethnography that explores both large-scale realpolitik manipulations of public health as a tool of war, and solicits fine-grained accounts of individual acts of mistreatment and iatrogenesis in clinical settings, our goal is, to borrow a felicitous phrase from Susan Greenhalgh, to change the stories medicine tells about itself. Please send your comments and ideas for SMA Section News columns to contributing editors Dori Beeler ([email protected]) and Laura Meek ([email protected]).